I feel like if I were taller in this picture I could look like Hagrid. Why didn't I put my hair up? SUPER low quality picture. i can't even make it bigger. i'm sorry. it's embarrassing. There is a magical place in our little city of Logan called Merlin Olsen Park. In the summer, MOP is just your average grass filled park with some jungle gyms and a rather beautiful river running through it, perfect for wading in. But in the winter? Oh, in the winter something special happens to it. It turns into the world's best outdoor ice rink! It's fantastically bumpy, with plenty of room to hobble around on. 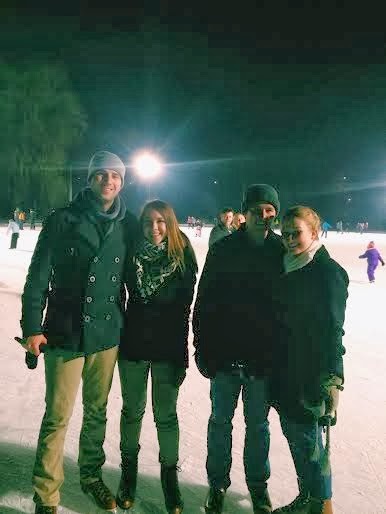 I say hobble, because I am probably the world's worst ice skater. I actually dislike ice skating quite a lot! But not when I'm at the MOP skate rink. Nope. For some reason when I'm there, I love it. Even when, after waiting in line for skates for 20 minutes, I'm told that they don't have a size 8, and I can choose between a size 5 and a size 10. I mean... how am I supposed to squeeze my feet into a size 5? I would like to speak to anyone who chose that option and see how that worked out for them. I chose the 10. It was uncomfortable, but I did not fall down! There was a small moment of wildly waving my arms in the air, and seeming as if I might topple over. But that was just to tease you all. I wasn't going fast enough to actually fall. ^^ This is my husband Alex. He pretends to fall asleep so he can get out of doing other things. Sometimes he pretends to fall asleep for no reason at all. We'll just be lying there, after enjoying a nice episode of Scrubs, and he starts fake snoring. I mean REALLY fake. But he won't give up the joke for like 5 minutes, so I've learned to just deal. This was him sleeping after frozen yogurt so that he didn't have to do homework. oh, so now he's awake and happy. I see. p.s. do you get today off? i do!! loving it. Pffft. A 5 and a 10. I'm a 9... hardest size to find EVER.